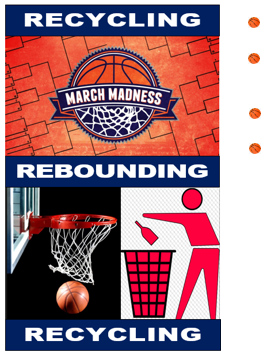 March Madness Festivities Include RECYCLING! CPCC FACILITIES SERVICES IS COMMITTED TO SAVING ENERGY AND SUSTAINABILITY! If you have any questions, contact Pam Metcalf, director of Energy and Sustainability at 704.330.6079. GCA Services is committed to increasing CPCC’s recycling and waste diversion rate. They recently held a recycling poster contest for their housekeeping staff and distributed personally written recycling messages to building occupants where their staff works. Continue to watch for more great things from GCA housekeeping staff in the future. GCA housekeeping staff uses color-coded collection bags to separate trash from recycling. Recycling baskets usually do not have liners because they are not recyclable. 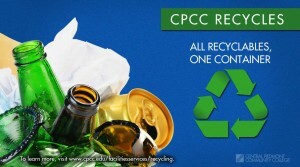 Thank you all for your recycling – CPCC has doubled its waste diversion in the past three years. If you have any questions-comments-suggestions, contact Pam Metcalf, CPCC director of Energy and Sustainability, at pamela.metcalf@cpcc.edu or at ext. 6079. What Kind of a World Do You Want Your Children and Grandchildren to Inherit? Sustainable development meets the needs of the present without compromising the ability of future generations to meet their own needs. 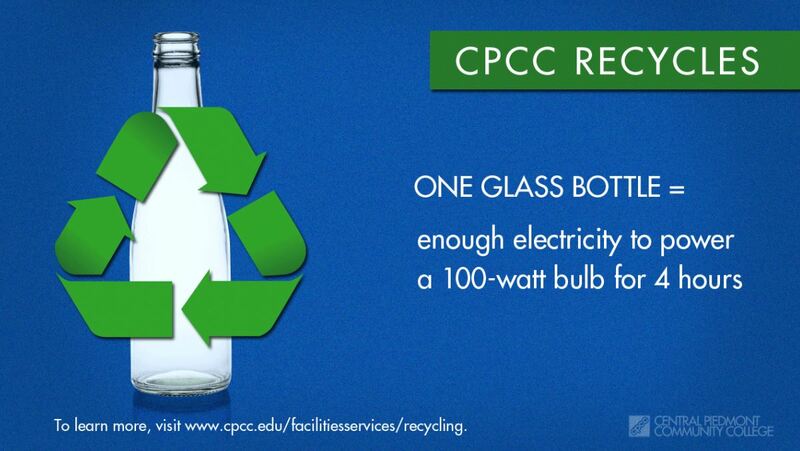 CPCC IS COMMITTED TO RECYCLING, SAVING ENERGY AND SUSTAINABILITY! CPCC’s Director of Energy and Sustainability, Pamela Metcalf, is engaged in facilities efficiency, sustainability and energy awareness. If you have suggestions, they can be emailed to Pamela.metcalf@cpcc.edu. We all know the importance of recycling and the benefits it can have on our environment and now we can add one more item to the list, bottle and jar tops. That’s right, caps and lids can stay, but the containers should be empty and dry. Until now, bottle caps and jar lids were placed in the trash for a variety of reasons; the recycling center does not accept them, they are made from a different type of plastic than the bottles themselves and could contaminate an entire batch of plastic if mixed in when being recycled, the processing equipment used could not separate the tops and lids from other types of plastic, and if left on the bottle, the tops could pop off creating a safety concern. But now, we found that in the curbside recycling system we use, it’s ok for caps and lids to “ride along” in the recycling process. So, don’t blow your top, instead place it back on the empty, dry container to be recycled. More information about recycling is available here. If you have any questions, contact Pam Metcalf, director of Energy and Sustainability, at 704.330.6079. If you have any questions, contact Pam Metcalf, Director of Energy and Sustainability at x6079. If you have any questions, contact Pam Metcalf, director of Energy and Sustainability, at ext. 6079. Saves enough electricity to power an average house for six months. 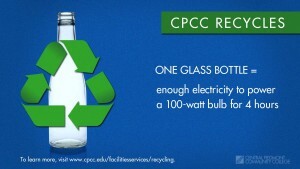 CPCC IS COMMITTED TO SAVING ENERGY AND SUSTAINABILITY! If you have any questions, contact Pam Metcalf, energy and environmental manager, at 704.330.6079. America Recycles Day is a national initiative of Keep America Beautiful (KAB). It recognizes the benefits of recycling while providing an educational platform that helps raise awareness about the value of reducing, reusing and recycling – every day – all throughout the year. It is the only nationally-recognized day dedicated to promoting and celebrating recycling in the U.S.
Each fall, thousands of communities across the country participate in ARD to promote environmental citizenship and encourage action. Through ARD, KAB, along with its affiliates and partners, inspires communities to directly engage their residents to recycle more and recycle right 365 days a year. 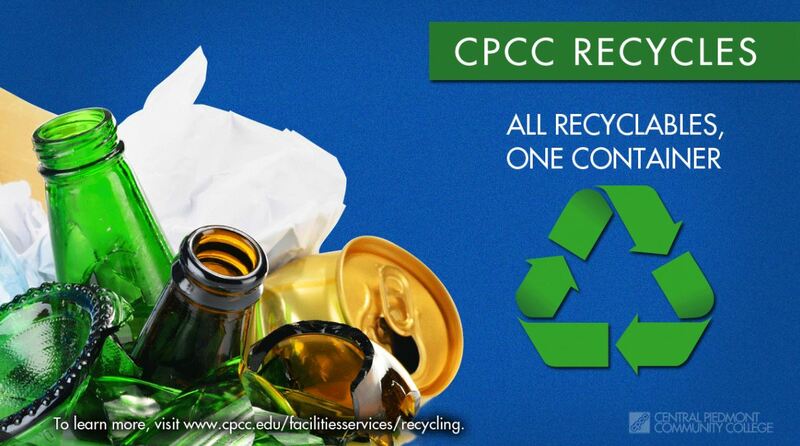 Use CPCC’s recycling receptacles that are located throughout the college. If you have any questions or suggestions, contact CPCC’s Energy and Environmental Manager Pam Metcalf at 704.330.6079 or at pamela.metcalf@cpcc.edu. Would You Rather Pay $9 or $39? 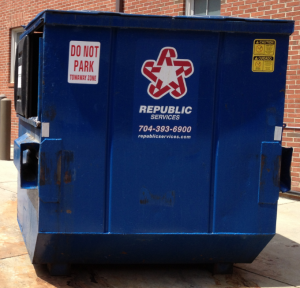 Should CPCC pay $9 to recycle a ton of paper or $39 to have it go to the landfill? A 2012 Mecklenburg County study determined that paper and food are the largest component of CPCC’s waste stream. Paper recycling is mandated by the County; failure to comply can result in fines for CPCC. 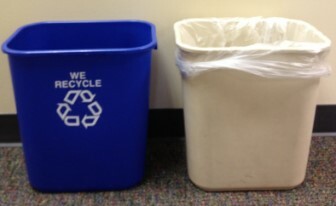 CPCC recycles all the same items as you recycle in your homes if you live in Mecklenburg County. Please dispose of these items in the designated recycling receptacles. 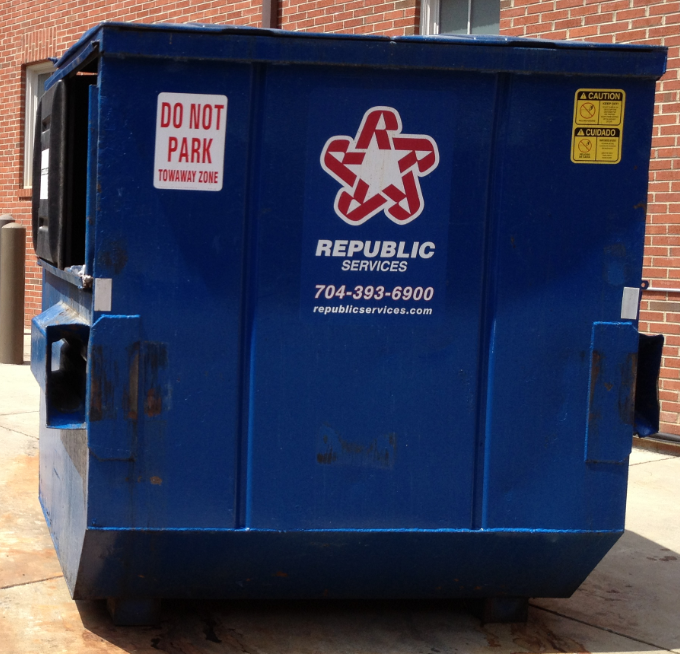 Doesn’t it make good economic sense for CPCC to increase recycling and decrease trash? CPCC has provided baskets for both trash and recycling. Usually located side-by-side for easy use and correct use. 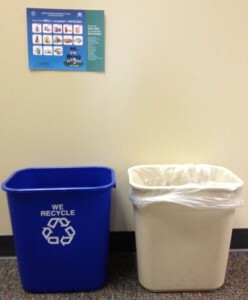 Please keep the “trash” out of the recycling basket, and the recycling out the “trash.” Signs in the room detail what is and is not recyclable. Facilities Services’ recycling goal is 35%; we are currently at 27.2%. 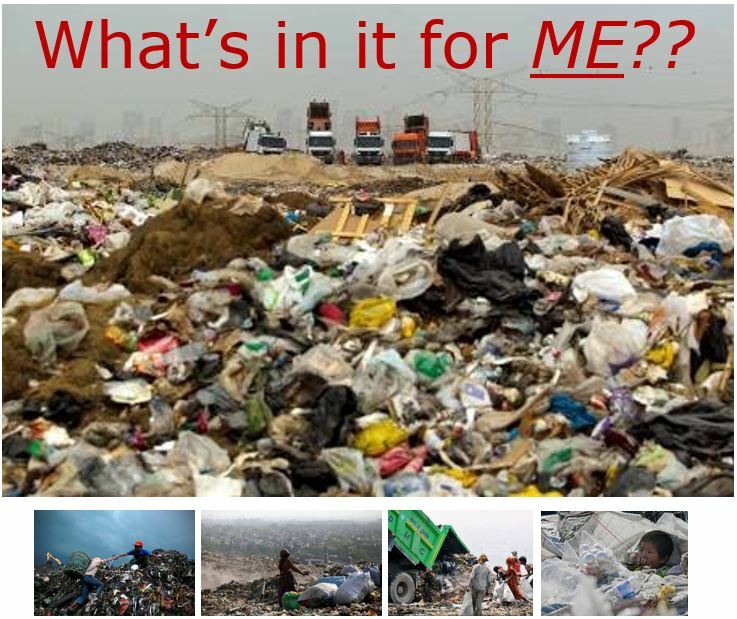 The cost of recycling is ¼ that of trash disposal. 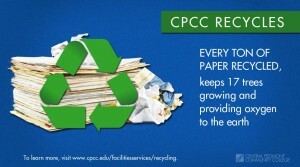 Help CPCC to contain costs and be more environmentally sustainable. If you have any questions, contact Pam Metcalf, CPCC energy and environmental manager, at pamela.metcalf@cpcc.edu or at ext. 6079.